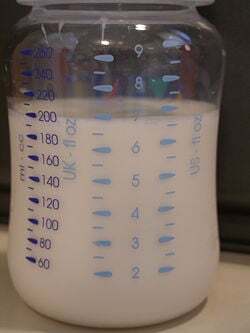 A baby bottle that measures volume in the three common systems of measurement: Imperial (U.K.), U.S. Customary, and metric. Measurement is the estimation of the magnitude of some attribute of an object, such as its length or weight, relative to a standard unit of measurement. Measurement usually involves using a measuring instrument, such as a ruler or scale, which is calibrated to compare the object to some standard, such as a meter or a kilogram. Metrology is the scientific study of measurement. In measurement theory, a measurement is an observation that reduces an uncertainty expressed as a quantity. As a verb, measurement is making such observations. It includes the estimation of a physical quantity such as distance, energy, temperature, or time. It could also include such things as assessment of attitudes, values and perception in surveys or the testing of aptitudes of individuals. The act of measuring often requires an instrument designed and calibrated for that purpose, such as a thermometer, speedometer, weighing scale, or voltmeter. Surveys and tests are also referred to as "measurement instruments" in such areas as academic testing, aptitude testing, and voter polls. Measurement is fundamental in science; it is one of the things that distinguish science from pseudoscience. It is easy to come up with a theory about nature, hard to come up with a scientific theory that predicts measurements with great accuracy. Measurement is also essential in industry, commerce, engineering, construction, manufacturing, pharmaceutical production, and electronics. The word measurement comes from the Greek "metron," meaning limited proportion. This also has a common root with the word "moon" and "month" possibly since the moon and other astronomical objects were among the first measurement methods of time. The history of measurements is a topic within the history of science and technology. The meter (or metre) was standardized as the unit for length after the French revolution, and has since been adopted throughout most of the world. When you can measure what you are speaking about, and express it in numbers, you know something about it; but when you cannot express it in numbers, your knowledge is of a meager and unsatisfactory kind; it may be the beginning of knowledge, but you have scarcely in your thoughts advanced to the state of science. Measurements always have errors and therefore uncertainties. In fact, the reduction—not necessarily the elimination—of uncertainty is central to the concept of measurement. Measurement errors are often assumed to be normally distributed about the true value of the measured quantity. Under this assumption, every measurement has three components: the estimate, the error bound, and the probability that the actual magnitude lies within the error bound of the estimate. For example, a measurement of the length of a plank might result in a measurement of 2.53 meters plus or minus 0.01 meter, with a probability of 99 percent. The initial state of uncertainty, prior to any observations, is necessary to assess when using statistical methods that rely on prior knowledge (Bayesian methods). This can be done with calibrated probability assessment. In science, where accurate measurement is crucial, a measurement is understood to have three parts: first, the measurement itself, second, the margin of error, and third, the confidence level — that is, the probability that the actual property of the physical object is within the margin of error. For example, we might measure the length of an object as 2.34 meters plus or minus 0.01 meter, with a 95 percent level of confidence. Laws to regulate measurement were originally developed to prevent fraud. However, units of measurement are now generally defined on a scientific basis, and are established by international treaties. In the United States, the National Institute of Standards and Technology (NIST), a division of the United States Department of Commerce, regulate commercial measurements. The definition or specification of precise standards of measurement involves two key features, which are evident in the International System of Units (SI). Specifically, in this system the definition of each of the base units refer to specific empirical conditions and, with the exception of the kilogram, also to other quantitative attributes. Each derived SI unit is defined purely in terms of a relationship involving it and other units; for example, the unit of velocity is measured in terms of length: 1 m/s (meter per second). Because derived units refer to base units, the specification of empirical conditions is an implied component of the definition of all units. Before SI units were widely adopted around the world, the British systems of English units and later Imperial units were used in Britain, the Commonwealth and the United States. The system came to be known as U.S. customary units in the United States and is still in use there and in a few Caribbean countries. These various systems of measurement have at times been called foot-pound-second systems after the Imperial units for distance, weight and time. Many Imperial units remain in use in Britain despite the fact that it has officially switched to the SI system. Road signs are still in miles, yards, miles per hour, and so on, people tend to measure their own height in feet and inches and milk is sold in pints, to give just a few examples. Imperial units are used in many other places, for example, in many Commonwealth countries that are considered metricated, land area is measured in acres and floor space in square feet, particularly for commercial transactions (rather than government statistics). Similarly, the imperial gallon is used in many countries that are considered metricated at gas/petrol stations, an example being the United Arab Emirates. The metric system is a decimalized system of measurement based on the meter and the gram. It exists in several variations, with different choices of base units, though these do not affect its day-to-day use. Since the 1960s, the International System of Units (SI), explained further below, is the internationally recognized standard metric system. Metric units of mass, length, and electricity are widely used around the world for both everyday and scientific purposes. The main advantage of the metric system is that it has a single base unit for each physical quantity. All other units are powers of ten or multiples of ten of this base unit. Unit conversions are always simple because they will be in the ratio of ten, one hundred, one thousand, etc. All lengths and distances, for example, are measured in meters, or thousandths of a meter (millimeters), or thousands of meters (kilometers), and so on. There is no profusion of different units with different conversion factors as in the Imperial system (e.g. inches, feet, yards, fathoms, rods). Multiples and submultiples are related to the fundamental unit by factors of powers of ten, so that one can convert by simply moving the decimal place: 1.234 meters is 1234 millimeters or 0.001234 kilometers. The use of fractions, such as two-fifths (2/5) of a meter, is not prohibited, but uncommon. The International System of Units (abbreviated SI from the French language name Système International d'Unités) is the modern, revised form of the metric system. It is the world's most widely used system of units, both in everyday commerce and in science. The SI was developed in 1960 from the meter-kilogram-second (MKS) system, rather than the centimeter-gram-second (CGS) system, which, in turn, had many variants. At its development the SI also introduced several newly named units that were previously not a part of the metric system. There are two types of SI units, base and derived units. Base units are the simple measurements for time, length, mass, temperature, amount of substance, electric current and light intensity. Derived units are made up of base units, for example, density is kg/m3. The SI allows easy multiplication when switching among units having the same base but different prefixes. For example, (dec, deci = 10) (Cent, centi = 100) (kilo = 1000) To convert from meters to centimeters it is only necessary to multiply the number of meters by 100, since there are 100 centimeters in a meter. Inversely, to switch from centimeters to meters one multiplies the number of centimeters by .01. A ruler or rule is a tool used in, for example, geometry, technical drawing, engineering, and carpentry, to measure distances or to draw straight lines. Strictly speaking, the ruler is the instrument used to rule straight lines and the calibrated instrument used for determining length is called a measure, however common usage calls both instruments rulers and the special name straightedge is used for an unmarked rule. The use of the word measure, in the sense of a measuring instrument, survives in the phrase tape measure, an instrument that can be used to measure but cannot be used to draw straight lines. As can be seen in the photographs on this page, a two-meter carpenter's rule can be folded down to a length of only 20 centimeters, to easily fit in a pocket, and a five-meter long tape measure easily retracts to fit within a small housing. The most common devices for measuring the passage of time are the clock or watch. A chronometer is a timekeeping instrument precise enough to be used as a portable time standard. Historically, the invention of chronometers was a major advance in determining longitude and an aid in celestial navigation. The most accurate device for the measurement of time is the atomic clock. Before the invention of the clock, people measured time using the hourglass, the sundial, and the water clock. Mass refers to the intrinsic property of all material objects to resist changes in their momentum. Weight, on the other hand, refers to the downward force produced when a mass is in a gravitational field. In free fall, objects lack weight but retain their mass. The Imperial units of mass include the ounce, pound, and ton. The metric units gram and kilogram are units of mass. A unit for measuring weight or mass is called a weighing scale or, often, simply a scale. A spring scale measures force but not mass; a balance scale compares one mass against another, but requires a gravitational field to operate. The most accurate instrument for measuring weight or mass is the digital scale, which also requires a gravitational field, and would not work in free fall. The measures used for economics are physical measures, nominal price value measures and fixed price value measures. These measures differ from one another by the variables they measure and by the variables excluded from measurements. The measurable variables in economics are quantity, quality and distribution. By excluding variables from measurement makes it possible to better focus the measurement on a given variable, yet, this means a narrower approach. Since accurate measurement is essential in many fields, and since all measurements are necessarily approximations, a great deal of effort must be taken to make measurements as accurate as possible. For example, consider the problem of measuring the time it takes an object to fall a distance of one meter (39 in). Using physics, it can be shown that, in the gravitational field of the Earth, it should take any object about 0.45 seconds to fall one meter. However, the following are just some of the sources of error that arise. First, this computation used for the acceleration of gravity 9.8 meters per second per second (32.2 ft/s²). But this measurement is not exact, but only accurate to two significant digits. Also, the Earth's gravitational field varies slightly depending on height above sea level and other factors. Next, the computation of .45 seconds involved extracting a square root, a mathematical operation that required rounding off to some number of significant digits, in this case two significant digits. So far, we have only considered scientific sources of error. In actual practice, dropping an object from a height of a meter stick and using a stopwatch to time its fall, we have other sources of error. First, and most common, is simple carelessness. Then there is the problem of determining the exact time at which the object is released and the exact time it hits the ground. There is also the problem that the measurement of the height and the measurement of the time both involve some error. Finally, there is the problem of air resistance. Scientific measurements must be carried out with great care to eliminate as much error as possible, and to keep error estimates realistic. In the classical definition, which is standard throughout the physical sciences, measurement is the determination or estimation of ratios of quantities. Quantity and measurement are mutually defined: quantitative attributes are those, which it is possible to measure, at least in principle. The classical concept of quantity can be traced back to John Wallis and Isaac Newton, and was foreshadowed in Euclid's Elements. In the representational theory, measurement is defined as "the correlation of numbers with entities that are not numbers." The strongest form of representational theory is also known as additive conjoint measurement. In this form of representational theory, numbers are assigned based on correspondences or similarities between the structure of number systems and the structure of qualitative systems. A property is quantitative if such structural similarities can be established. In weaker forms of representational theory, such as that implicit within the work of Stanley Smith Stevens, numbers need only be assigned according to a rule. The concept of measurement is often misunderstood as merely the assignment of a value, but it is possible to assign a value in a way that is not a measurement in terms of the requirements of additive conjoint measurement. One may assign a value to a person's height, but unless it can be established that there is a correlation between measurements of height and empirical relations, it is not a measurement according to additive conjoint measurement theory. Likewise, computing and assigning arbitrary values, like the "book value" of an asset in accounting, is not a measurement because it does not satisfy the necessary criteria. Measuring the ratios between physical quantities is an important sub-field of physics. Adams, Dany Spencer. 2003. Lab Math: A Handbook of Measurements, Calculations, and Other Quantitative Skills for Use at the Bench. Cold Spring Harbor, NY: Cold Spring Harbor Laboratory Press. ISBN 978-0879696344. Bucher, Jay L. 2004. The Metrology Handbook. Milwaukee, WI: ASQ Quality Press. ISBN 978-0873896207. Curtis, Mark A., and Francis T. Farago. 2007. Handbook of Dimensional Measurement, 4th ed. New York: Industrial Press. ISBN 978-0831132620. Kimothi, Shri Krishna. 2002. The Uncertainty of Measurements: Physical and Chemical Metrology: Impact and Analysis. Milwaukee, WI: ASQ Press. ISBN 0873895355. Mills, Ian. 1993. Quantities, Units, and Symbols in Physical Chemistry. International Union of Pure and Applied Chemistry. Oxford: Blackwell Scientific Publications. ISBN 0632035838. Pedhazur, Elazar J., and Liora Pedhazur Schmelkin. 1991. Measurement, Design, and Analysis: An Integrated Approach. Hillsdale, NJ: Lawrence Erlbaum Associates. ISBN 0805810633. This page was last modified on 11 September 2018, at 16:34.